There is no secret to success other than hard work on and off the court. This summer the Club saw an unprecedented eight athletes (current and former) selected to National teams along with ten Team Ontario selections. Strength and conditioning is a vital component to future success by building strength and avoiding injury for the athlete. The new two year partnership will ensure that Nick Haince will lead the Strength and Conditioning program for the Club as well as our HP athletes will be training out of the Capital Strength facility (2190 Thurston Drive). Coach Nick will drive our change in culture that success on the court starts with success off the court in the weightroom. Our Club’s sincere appreciation goes out to our former Head Coach, Tyler Vivian who due to professional commitments was unable to continue in this role for the Club. Capital Strength Training System (CSTS) was founded by three partners, Eric Lepage, Nick Haince and Scott Heffernan. The three coaches have over 20 years of combined experience with amateur and professional athletes in the Ottawa area. The founders of CSTS are known for their expertise in the hockey world; they are the home to a long list of NHL, AHL, OHL, NCAA, Junior A hockey and minor hockey athletes in Ottawa. They also train a number of Ottawa’s up and coming NHL prospects and Ottawa Senators hometown boys Marc Methot and Eric O’dell. While they have made a name for themselves developing Ottawa’s top hockey athletes, they are extremely excited about the new partnership with the Maverick Club. 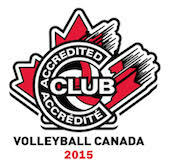 The coaches from CSTS bring a ton of experience with amateur athletes to the Maverick Club. Their goal is to take the Maverick training and performance to the highest level possible while developing not only better volley ball players but better people. Their approach encompasses more than just athletic training, but building qualities and values in their athletes in order to prepare them for higher levels of sport, school and life. The facility at The Capital is unlike any other in the city, it is modelled like collegiate level athletic training facilities that are found across the United States in NCAA colleges. The training area is 3,600 square feet that includes 10 squat racks, 900 square feet of athletic turf and all the tools within to develop their athletes in the best training environment possible. They offer a combination of high-end training along with Ottawa’s premier training facility, a new home for the Mavericks that will further establish a dominant Strength and Conditioning culture within the club. How does the Club know this is going to work? The Club piloted our summer strength and conditioning program with the Capital and the reviews from those participating have been excellent. The facility is unmatched in Ottawa and the trainers have pushed these athletes to new levels for each and every session. Quite frankly, million dollar professional hockey players trust their careers to the Capital and Nick, Scott and Eric. Strength and conditioning is engrained in the hockey culture and the city’s best trust the Capital. What does that mean for me as an HP athlete? It’s the beginning of a culture change and with any change there are questions and doubts but like the detractors that thought the Club would be unable to run the country’s first high performance Club program in 2004 we will prove them wrong. Putting the science and developmental stages aside, strength and conditioning is the key to long term player development. A stronger and less injured athlete is the better performing athlete. Strength and conditioning training is now in the forefront of the HP program. HP athletes will continue to train twice a week but the timing in which they train will change. In the past we have had our HP teams train in high school gyms during their practice days either an hour before the on-court session or an hour after. That model will change going forward. We will no longer be training in the high school gyms and teams will be required to train one night a week outside of their regular on-court training night. The 16U Girls HP team’s on-court training is Tuesday, Thursday and Sunday. They will add an additional hour of training on Wednesday night at Capital Strength. On Sunday, the team will train at Capital Strength either before or after their on-court training. Why is the Club adding an additional night? We believe the benefits will far outweigh the negative. With Capital Strength’s state of the art facility and abdunance of equipment and resources we no longer require the high school weight rooms. Remember it’s a change in the culture and increased focus on strength and conditioning within the Club. Capital Strength can accommodate two teams per one hour session and that will immediately foster a healthy competitive yet supportive environment. We know how creative our families are and they will quickly arrange for car-pools to get the athletes to the facility and we are certain that they will quickly change their questioning from why the extra night of driving and commitment to how come we didn’t do this sooner. No doubt the costs for this program will increase compared to last season. The Club will endeavour to contain the price increases and its impact on the families. Early cost projections from the Club have an increase of $65 on the monthly installment payments paid last year or $8 per workout (8 workouts in a month). Please note these are early projections. We are certain that the return on this financial commitment will be well worth it. The Club is excited with this agreement and is looking forward to the progress that our athletes will be making on and off the court.